$5 per day or $30 for a year pass. Pay at the Eldorado Outpost gas station or Mullinix gas station just outside of the park. Many trails are accessible to stock (unmodified) four-wheel drive vehicles. Individual trails vary in length from 1.4 miles to 3.4 miles, but OHV area networks trails into approximately 20 miles of contiguous trails with minimal recrossing. Some areas may be traversed in a different manner greatly increasing or decreasing the technical difficulty of the obstacle. The Badin Lake OHV area is made of former logging and mining trails cut into mountainous terrain and the Uwharrie River basin. You will go through many small towns, IE: Siler city, Ramseur, etc..
Take highway 49 until you see highway 109 exit..
at bottom of ramp turn left.. you will now be on highway 109..
You will stay on this road for about 10 to 15 mins..
on your right you will see A big open field and a Gas station (it is called Eldorado Outpost). Pull in park and go inside and purchase either an OHV day trail pass or a yearly trail pass so you will be allowed to wheel legally on the trail system. 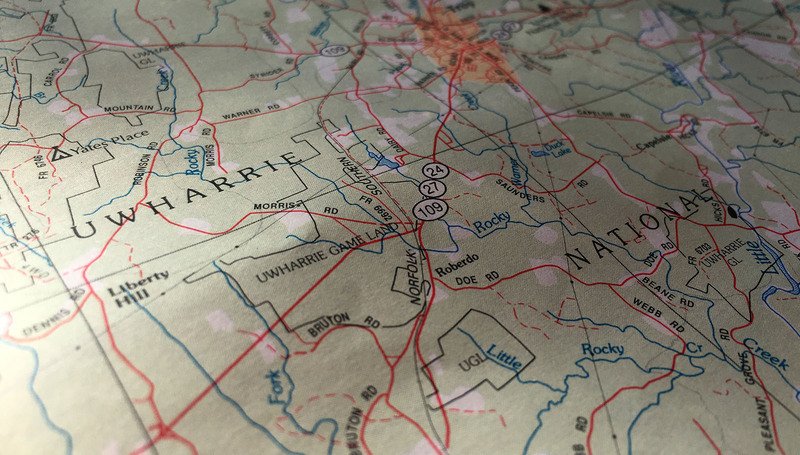 Now follow the map to get to Uwharrie National Forest, a minute or two south of Eldorado Outpost.